Will any scoring drive take less time than it will take Gladys Knight to sing the national anthem? : Yes -125, No -115 - This one is fairly easy and straightforward to break down. The anthem typically takes around a minute and 50 seconds, and that's where the number is set this year for Gladys. If anything, she might go a little longer - she has the voice to drag some things out in a good way. So, will these teams score faster than that? It's a good bet. 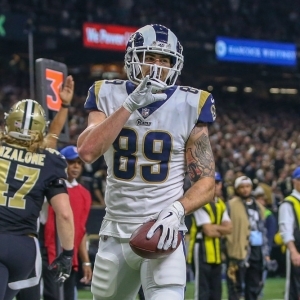 The Rams scored only two touchdowns on Sunday, but one took just 1:29. And the Patriots' last scoring drive in regulation took only 1:24. So, both teams went well under the 1:50 mark last time. It seems like a safe bet that one will be able to under here. Will any TD be overturned by replay? : Yes +150, No -200 - The officials are going to have a very itchy trigger finger when it comes to reviews and getting things right in this game. All of the officials will have heard endlessly about how badly the New Orleans game went with that blown call and how that just can't happen again. And the coaches are going to be touchy as well to protect their interests. There is a decent chance that the replay officials will be in play in this game. So, while I don't think there is a ton of value in this price, I certainly lean towards the over. Will there be a flea flicker attempt in the game? : Yes +155, No -220 - The no is reasonably favored here for two big reasons - it's not exactly a play that shows up in every game, and the Patriots used one in the AFC Championship Game. But I am a little tempted by the yes for one big reason - the Patriots play didn't work. It was kind of a mess, actually. It would likely catch the Rams off guard to go back to it again, and McDaniels and Brady could look to try it again just to show that it could work again. What will be the predominant color of Adam Levine's top at the start of the halftime show? : Black -180, Any other color +140 - I will admit up front that I am not at all privy to Adam Levine's fashion choices. Also, I really couldn't care less about what Levine wears in this spot or any other. So, I will do what I do in any situation where we have a prop like this - I'll head to Google Images. When I typed in Adam Levine there were 21 pictures out of the 39 that showed up on the first page in which he was wearing black. That's a majority, of course, but not nearly enough to justify the -180 price. Based on that alone, I'll jump on the underdog. Will both teams combine to score 76 or more points to break the Super Bowl record? : Yes +350, No -600 - The total in this one could be the highest we have ever seen in the Super Bowl - the game sits at 57.5 or 58, depending on the outlet, as I write this, and the highest number we have ever seen is 57. And the Rams have the second-best scoring offense in the league, while the Patriots have fourth-best - and both teams have shown the aptitude to play fast and lose when against another strong offense. So, the potential is there. But 76 points is a lot of points. Not an impossible amount, though. The Rams went over 76 three times this year - in the opener against San Francisco, in the loss at the Saints, and in that truly insane game against the Chiefs. The Patriots haven't been quite as explosive, but they also did go over this number in their game against the Chiefs. The biggest challenge here, though, is that the Rams haven't been at their explosive best in the postseason, and the Patriots have a flawed defense, but one that is sneaky good at limiting opponents scoring even if they allow yards. I know I have been all over the place here, but that's appropriate to how this prop breaks down. In the end I would lean fairly strongly to the no - offenses have a tendency to not be their best in this game. But I see no value at all in the no price.